It’s December again: time for all that holiday gift shopping that you’ve been “looking forward to.” Never fear! The Gadget Zone has some cool gift ideas for techies that will cross some of the most difficult names on your list. Imagine being able to record and then playback free TV shows captured by an over-the-antenna; just as you do now with the paid shows you get on cable TV, Fibe, or satellite: You can do this using the TiVo BOLT set-top box! Although the BOLT is designed to work with cable/Fibe/satellite feeds (plus TiVo’s own service in ths U.S., or via Cogeco in certain parts of Canada), it can also accept and record programs from a TV antenna using its on-board tuner. This means you no longer have to use a VCR – if anyone still has one – to record and time-shift free over-the-air TV. 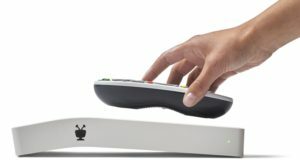 The TiVo BOLT is also designed to accept feeds from internet streaming services such as Netflix and YouTube, plus feeds from computers and mobile devices. It even supports 4K broadcasts from the web, and has a built-in remote control finder; how cool is that?! Look up the TiVo BOLT on www.Amazon.ca (prices vary), and be sure to buy the white BOLT box because the black BOLT+ doesn’t handle an antenna input. Speaking of HDTV antennas, it is possible to get the major Canadian TV networks off-air in stunning HD. In fact, the HDTV signals you can receive off-air are actually better-looking than what you get on cable, Fibe, or satellite, because its signal hasn’t been compressed. The Antennas Direct ClearStream Amplified Indoor Digital TV Antenna (model CSM1-XG-CN) combines an elegant-looking indoor unit with high performance HDTV signal reception. Whether you connect this antenna to a TiVo BOLT or directly to your HDTV – you don’t need a BOLT to use it – the ClearStream will boost your incoming signals by 20dB. 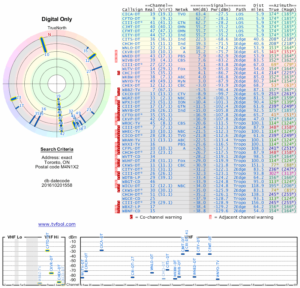 This means that you should be able to scan for and receive more distant stations (using your TiVo or TV’s Set-up Menu) than you could using a standard unamplified HDTV antenna. $129.99 at www.bestbuy.ca; US$99.99 at www.antennasdirect.com. One big hint: Be sure to rotate your antenna, to point it towards the most distant/weakest signals you are trying to receive. If you are just relying on the Canadian channels in Toronto, they are all broadcast from the CN Tower downtown. To find out what HDTV stations are available off-air in your area, go to the highly useful TV Fool site: www.tvfool.com. You just enter in your address and TV Fool calculates the available channels, their location, and relative signal strength relative to your location. This free image shows what is available around my old house at Lawrence and Yonge in Toronto. Here are a few links to various versions of this DIY wonder. The first one is the model I built. Previous: St. Lawrence Neighbourhood: the key to affordable housing?